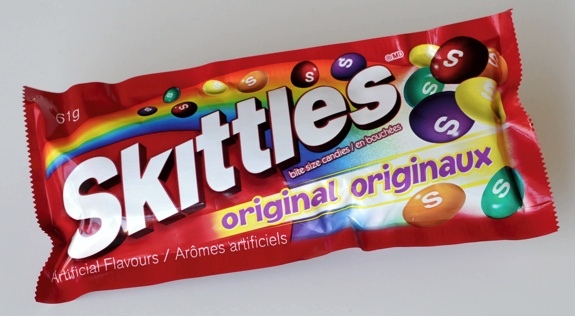 Original Skittles is the way to go. Forget those wacky also-ran flavours. Tropical? Pbffft. Forget it. How much do I love Skittles? You know that 1-800 number on the back of food products that nobody ever calls? 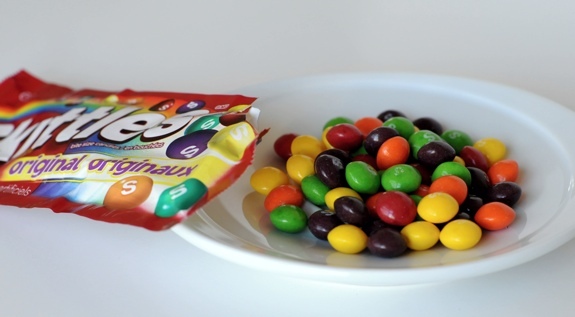 Well, a few years back, when they swapped out lime for apple flavouring in the green Skittles, I called and gave them a piece of my mind. I felt like a grumpy, monocle-wearing gentleman shaking my fist at change, but dammit, I wasn’t going to let them kill off my second-favourite Skittle flavour without putting up a fight. I think it’s a childhood thing. Lunch-break trips to the pharmacy near Ecole Robert Browning, my elementary school in Winnipeg, ended with Double-Bubble, Bazooka Joe, and packs of Skittle goodness. You could individually savour each little piece of candy, or pair them up for flavour combinations. 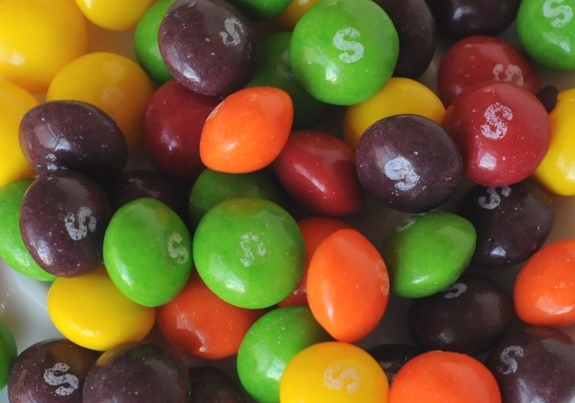 To this day, Skittles have a special ability to boost my mood and put a smile on my face. It is a testament to my Skittle dedication that I still stupidly drop change into the vending machine at my workplace’s cafeteria, even though the slot for the Skittles is regularly broken and steals my money. Sure, there are packages of other Skittles flavours out there (even more in the States, if past trips have taught me anything), but there’s nothing like the original five: grape, lemon, strawberry, orange and lime. Tropical schmopical. I’m all about the classics. 5. Grape. Not bad at all, really. But it reminds me of grape Dimetapp, a common household remedy whenever young me got a cold. Memories of sick days spent watching The Price is Right. Grape Crush, basically. 4. Orange. A cross between orange Creamsicle and the giant yellow vats of McDonald’s orange drink that appeared at every late-1980s school picnic. 3. Lemon. A nice citrus taste, more like lemon zest than lemon juice. Not sour, but not as cloying as a standard lemon lollipop. 2. Lime. Different enough from lemon that it justifies having its own spot on the roster of five flavours. It’s a juicy, key-lime taste that reminds me a bit of 7-Up crossed with Lime Crush. 1. Strawberry. One of the most spectacular artificial flavours I’ve ever tasted. Ripe berries swimming in a bowl of cream. Lingers. Skittles have a strange ability to cheer me up. I mean, just look at them. It's like a bag full of happy. Cost: $1.35 at a convenience store. Value for cash money: For 56 little pieces of heaven, excellent. Nutrition? : 250 calories per package, including a fair bit of saturated fat. One package does, however, contain 70 per cent of the recommended daily vitamin C intake. Good news for old-timey sailors looking to avoid scurvy. Oddest ingredient? : Hydrogenated palm kernel oil, the third item in the list. Not surprising when you consider the chewy texture and soft mouthfeel. Still, you don’t think oil when you think Skittles. The verdict: Pure bliss. If I could live on nothing but Skittles, I would. The gentle gloss of the Skittles shell. So colourful, so yummy, so addictive.